Limited to 1 per customer account. Duplicate orders will be cancelled. To commemorate the 30th Anniversary of the Star Wars: Droids Animated Series, Gentle Giant LTD is happy to announce our Star Wars Celebration VII Exclusive Droids C-3PO Kenner Inspired Jumbo Figure! Digitally scanned from mint 3 3/4″ Kenner originals and reproduced in 12″ scale to the rest of the jumbo Kenner line in full detail. Injection molded and made of durable plastics, this figure features original articulation. 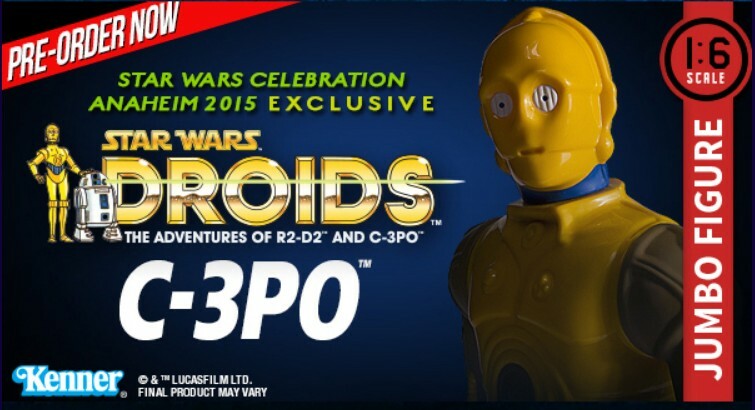 The Star Wars: Droids C-3PO figure will even feature a jumbo replica of the coin that came with the original figures! To further capture the vintage feel, Gentle Giant has packaged this figure with a Star Wars Droids inspired backer card featuring original photos and artwork. Designed with the collector in mind, the figure comes in a re-sealable plastic outer clam shell to help protect and display this limited edition figure. After the destruction of the Death Star at the Battle of Yavin, General Pharl McQuarrie was personally selected to head up construction of a new Rebel base on the ice planet of Hoth and placed second in command of the facility upon its completion. Echo Base offered the alliance a much needed chance to rest, re-equip and re-group after the Yavin campaign. The respite was short lived however when the bases location was discovered by the Imperial fleet and quickly fell under a vicious siege led by Darth Vader and his elite ground forces. McQuarrie was instrumental in coordinating a delaying defensive action against the overwhelming Imperial forces and afforded the vast majority of personnel and equipment time to escape and fall back to a rallying point. 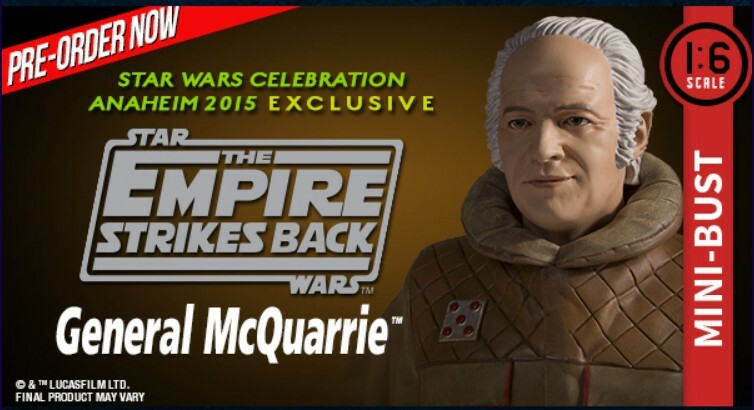 Portrayed by legendary concept artist Ralph McQuarrie for a brief cameo in The Empire Strikes Back, this exclusive General McQuarrie mini-bust from Gentle Giant Ltd. is a celebration of his immeasurable contributions in shaping the Star Wars universe. Limited to only 500 pieces, this piece features an exacting likeness of Mr. McQuarrie with fine details including cold-weather issue command parka, command gauntlets, insulated watch cap with com unit, face wrap and anti-glare goggles. interesting given that like the holiday special droids is considered along with the ewoks cartoon a red headed step child of the star wars universe. to see a animated c3peo figure again. and hard to believe the show was on 20 years ago.